Select the playlist by clicking it, hover your mouse over the playlist title, and then click again. Pressing the F2 key while clicking the playlist name also works. 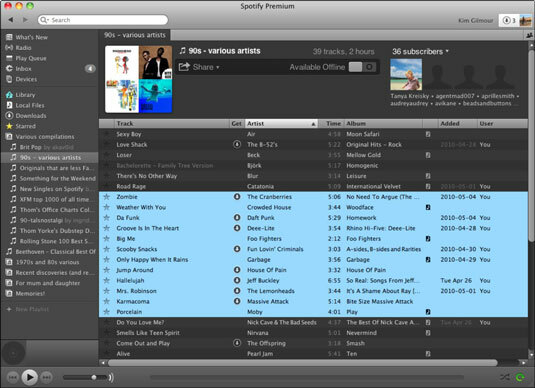 Alternatively, right-click the playlist, and then select Rename from the pop-up menu that appears. The entire title becomes highlighted. Either press the Delete key to erase everything and then type the new title, or simply start typing to overwrite the current title. If you made only a small typo, hover your mouse in the area you want to erase and click, which brings up a blinking cursor; you can press the Delete or Backspace key to erase incorrect letters one by one. Open the playlist, and then click any track within it. Select all the tracks by pressing Ctrl+A (Command+A on a Mac). Drag and drop the higlighted selection onto the New Playlist title at the bottom of the left sidebar. 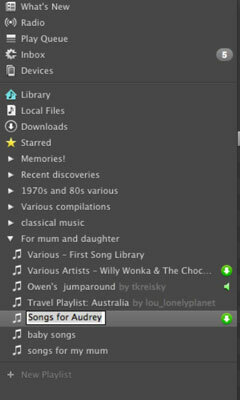 Right-click the playlist, select Rename from the pop-up menu that appears, and enter a name of your choice in the now-editable playlist title. Alternatively, create the playlist name first, and then drag all selected tracks to it. In a way, copying someone else’s edited selections that they’ve carefully crafted into a playlist and giving it a new name seems a little like plagiarism, doesn’t it? But there are legitimate, practical reasons for renaming playlists your way, particularly if you already have your own system of organizing tracks down pat. To select multiple tracks at the same time to drag into a playlist, Ctrl-click your desired tracks (Command-click on a Mac). To select a range of tracks from a particular view that are listed one after the other, click the first track and, while holding the Shift key, click the last track. The entire range becomes highlighted.